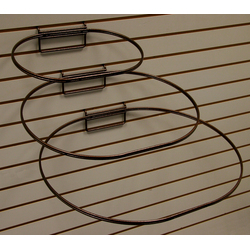 These wicker basket display rings mount quickly and easily to slatwall, allowing you to design your own unique display. Rings are available in a variety of sizes to meet your needs. Bring a unique design element to your display area with these wicker basket holders.